For more tips on creating with the O Holy Night collection, watch the tutorial at https://youtu.be/UWDeK6soJ0E. Instructions: Click here to view a larger photo of this project. Using your foam, diecut 1 large and 3 medium poinsettia. Once complete take your brush pen and color over the stamp and stamp onto your foam poinsettia. Now you will apply a small amount of heat to each poinsettia to shape. Take your piercing tool and pierce through the center and apply your gold stamen bunch. Cut a piece of the designer paper to fit the tag, round the corners and adhere to the tag using dries clear adhesive. Stamp your O Holy Night shepherds image onto the watercolor paper using the hybrid ink. Diecut with the coordinating die. Once done color your image using the zig clean color brush pens. 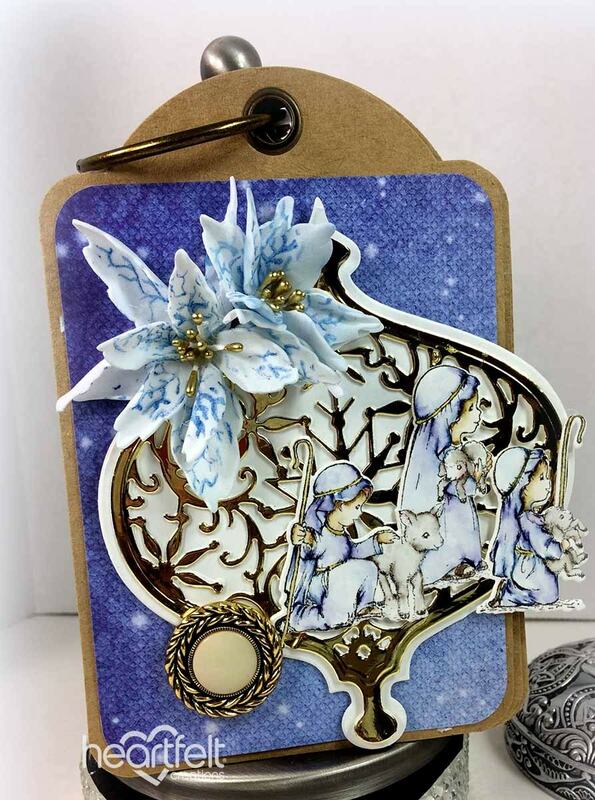 Take your ornament die and diecut the decorative layer using the gold mirror paper and diecut the mat with the white cardstock. Adhere together and this will lay over the patterned paper on the tag. Now take your stamped images and adhere to the tag laying a slight bit off the page. Now glue your foam poinsettia flowers to the top portion of the tag for added decor and glue the button towards the bottom of the ornament to complete the overall look.